You probably have a friend who doesn't follow football that closely and thinks the Chargers are really great. He likes that they have Antonio Gates, who is a killer in fantasy, and Vincent Jackson. He thinks Philip Rivers deserves to be mentioned with Tom Brady and Peyton Manning as the best quarterbacks in the NFL. He believes that San Diego still has Shawne Merriman, who's Lights Out despite that steroids thing, and LaDainian Tomlinson, who's the better LT, you know. "Bottom line, I believe these two men give us the best chance to get back to the playoffs," owner Dean Spanos said in a statement. "A.J. 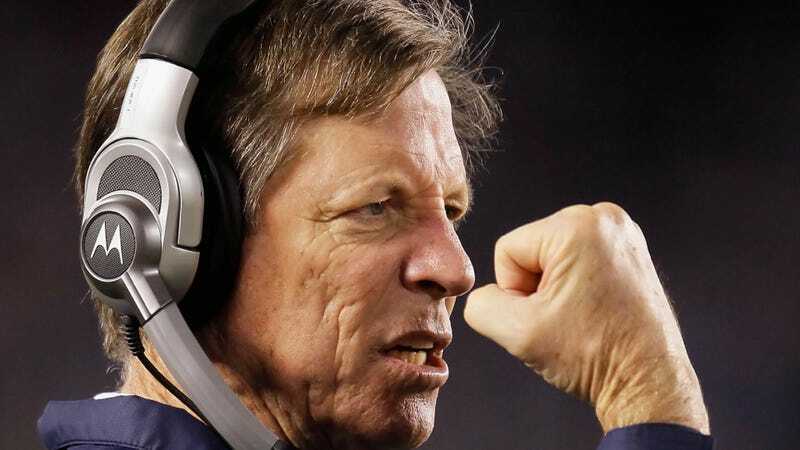 Smith is the best man to improve our roster, and Norv Turner is the best man to lead that roster on the field." Uh, Smith's management of his backfield alone explains why he is not that best man. He traded up to grab Ryan Mathews 12th overall in the 2010 draft. This came after letting Michael Turner walk and before letting Darren Sproles walk. He also already had Mike Tolbert on the roster AND had already spent a third-round pick on LSU fullback Jacob Hester. This is to say nothing of his wacky, useless first rounders like Buster Davis, Antoine Cason, and Larry English. Seriously, A.J. Smith picked those three back-to-back-to-back. We could say nice things about Malcom Floyd and Eric Weddle, but we'd be wasting your time. And—as if Smith's drafting wasn't bad enough—Norv has Norved the hell out of his six Charger teams. He lost division crowns to Kansas City and Denver in the last two years. And when he did make the playoffs, he settled for field goals and punts. He has a nice record with the Chargers (49-31) because he plays in a division with Oakland, Denver, and Kansas City, teams perhaps even more mismanaged than San Diego. When Norv coached in Oakland, he was 9-23. This man is not a good coach. But they beat Baltimore and beat Oakland (in a Raiders must-win) toward the end of the season, and that looks nice, so Smith and Norv hang around. Perhaps next year San Diego will be fortunate enough to win the division at 8-8 and host a playoff game just to remind everyone what fake success feels like.